You will often hear about the “conscious” and “subconscious” mind. Heck, I even use the metaphor a lot on this site. Generally, the term conscious mind is used to describe the things you are consciously aware of, or able to report (your thoughts, feelings etc) whilst the subconscious mind describes all the things that go on below the surface of awareness. Perceptions, feelings, and thought processes leading to sudden ideas or memories can all happen subconsciously. You might hear about an iceberg, and how the tip is our conscious mind, the rest floating below the surface. Although this offers a nice visual analogy to relate to, its actually really unhelpful, because icebergs are “fixed”. What is below the water tends to stay below the water, whilst our minds are a lot more flexible and dynamic in terms of what may drift in and out of conscious awareness at any given second. You will often hear hypnosis described as the process of communicating with your subconscious, or unconscious mind. Whatever it hears, takes hold and is absorbed deep down, where it will change your thoughts and behaviours – or so they say. Although this sounds like a nice simple idea, its also a reason that the whole concept of hypnosis is hard to really appreciate and understand for most people. What is this “subconscious mind” that is listening out, like some other person living in your brain, pulling the strings? And if the subconscious is there, listening and responding, then what is the conscious mind really about? Why doesn’t the conscious mind just listen and respond in the same way? People have all kinds of explanations and theories about this, but when it comes to hypnosis they all lead to the idea that your conscious mind needs to be “relaxed” in order for the subconscious mind to be “open” and suggestible to ideas. 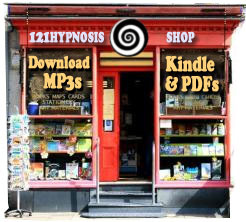 I used to go for this idea myself, indeed its a model that almost every book about hypnosis supports. But more recently, I’ve noticed just how limiting and inaccurate the model is. Its like this. Imagine that your conscious mind is ice, and your subconscious mind is water. We have two options in working with that model – one, which is akin to the common idea about the subconscious, is to treat them as separate “stuffs” with separate characteristics. “Get the ice cubes out of the way, so that we can work with the water” (or something like that). The second option though, which isn’t really talked about much but one which I lean much more towards, is to treat them both as the same stuff – its all made of water molecules. Whether the state is ice or water becomes more meaningless, as you’re essentially still dealing with water molecules. Why is this subtle distinction important? The model of the conscious and subconscious mind has had the unfortunate effect of leading people to identify with the idea of their conscious minds. The subconscious mind is then seen as something “other”, this other mind that isn’t quite ‘them’, that is operating like a machine somewhere in the background. The very idea of this dissociation, which is reinforced by most explanations of hypnosis (“I’ll just put you in a hypnotic trance so I can talk to this other thing that’s squatting in your mind”), undermines the full, complex nature of what you actually are. If your subconscious mind is really running the show, and its ideas and suggestions have ultimate power over your mind, then why would you even want your conscious mind to be “online”? What would be the point? To get your head around this problem, consider the idea of giving your own subconscious mind a suggestion that would take hold, at a deep, compulsive level. Could you give yourself a suggestion like that? Say you have a phobia of spiders – could you give your subconscious mind a suggestion to not be afraid, so that you could easily handle one? Without any external influence? You might think you can – and think of situations where for example, someone gives themselves an affirmative positive suggestion to overcome some fear, summoning the necessary courage to do something. But did they really consciously override their subconscious mind, or did their subconscious mind conjure the thought, and consequential feeling of conscious will, to do something? What I’m suggesting is that your conscious mind, or whatever you think it is, is just an emergent property of your subconscious mind – there is no real separation. Milton Erickson (the most revered, accomplished hypnotherapist in history) used to say that the greatest discovery a person can make isn’t that they have a subconscious mind, its that they only have a subconscious mind. Something like that anyway. I wrestled with that idea for a while, because the idea of not having a conscious mind causes obvious problems – especially as we tend to over-identify with this aspect. To really appreciate what he was trying to say, requires a complete about-turn in how we think about the mind. You really do need to turn it all upside down, and look at it as being made of the same “stuff”. For me, the easiest way to look at that stuff is as automaticity. The idea is this. Your subconscious mind is automatic – it is responsive, compulsive, and works on a complex system of cause and effect just like any other complex system. But your conscious mind is the same – it is also automatic, responsive, compulsive, and works on a complex system of cause and effect just like any other complex system. So whats the difference – why are we aware of some things (thoughts, feelings etc) and not others? Whats that distinction about? Well, its simply the case that some thoughts or actions carry or trigger an accompanying “feeling” of conscious will. That’s where our conscious awareness comes in. You simply feel more aware and ‘in control’ in some moments, more than others. But its an illusion – because you’re never really in control of anything – at least not in the way that we tend to think we are. We can still use the words control, or choice, or free will to describe ourselves from an external viewpoint. But essentially, our thoughts and actions are a part of the overall sea of cause and consequence in the same way as all other “stuff” is. Here are some questions to ask yourself, to put this all into perspective a bit more. How often do you really choose what to think about? Do you choose your thoughts, or do they just happen? How often do you really choose how you want to feel? If you ever do choose how you want to feel, does that mean that you never feel sad, or depressed, or anxious? If you do, why can’t you simply choose not to? Have you ever explained away some unwanted actions or behaviours as being down to tiredness, or anxiety? If so, why should tiredness or anxiety take away your ‘control’ any more than usual? Could it not be that when not-tired, or not-anxious, your actions/behaviours are just more resourced because your brain has more energy to take on board more experience/memory/perception to have more useful consequences? Do you really have any more choice over yourself than a stream does, choosing its way down a complex array of pebbles and earth? If we did have free choice, why are people so irrational, compulsive, and predictable? If our feeling of conscious will wavers and meanders so much (e.g. driving, getting lost in a task, becoming distracted), does that not suggest that the feeling itself is consequential of other things, rather than something we choose to have or do? What were you thinking about ten minutes ago? What will you be thinking about in three minutes time? Just how in control do you think you are?